We want you to read this posting and then pass it along or tell others what you have learned. This page outlines what we encounter daily and sincerely hope we are able to help others understand how to keep safe and prevent getting ripped off by internet scammers. These programs are floating around the internet and are designed to be installed very quickly through deceiving you within a website. The main goal of these programs are to appear like they are scanning and finding errors instantaneously. Some examples of these errors are Hard Drive errors, Registry errors and reports of current system infections. Do not enter any information into these applications. 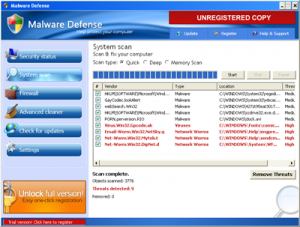 Get it cleaned immediately and consider changing your previous antivirus application. We have reports from clients about people calling them at their residences claiming to be their internet provider (Shaw, Telus, etc…) They will insist there are problems with your computer and threaten you to follow their instructions as they guide you to a website where these fake anti-virus applications are installed. They will also insist that you provide them with credit card billing information – DO NOT give them ANY billing information, it accomplishes nothing. Try and hang these people up on the phone for as long as possible with stupid computer questions and ask them to hold while you make coffee or use the rest room. Why? The success of their telephone campaign is to contact as many people as possible. It’s purely statistical and by utilizing the time they could have contacted 5 other potential victims, you help slow down this epidemic until more people are aware. Your ISP will never contact you to fix problems on your computer and request billing information. Please pass this information along and keep safe out there. The internet is meant to make our lives easier through information and connectivity. Do not let someone take advantage of this and make you a victim.